NKBA Palouse is the local chapter that brings together local Palouse Kitchen & Bath distributors, retailers, remodelers, manufacturers, fabricators, installers, designers, and other professionals – and provides a resource for local consumers to research, educate and connect with Palouse Kitchen and Bath professionals. Click here to visit the NKBA Palouse website. Come see your 2019 SFCC Design Students award winning Designs! A winning entry in this competition increases industry visibility and peer recognition, offers valuable publicity opportunities, and acknowledges the talent of aspiring kitchen and bath designers. Students must plan beautiful, safe and functional spaces, incorporating creative design statements and aesthetically pleasing design solutions. 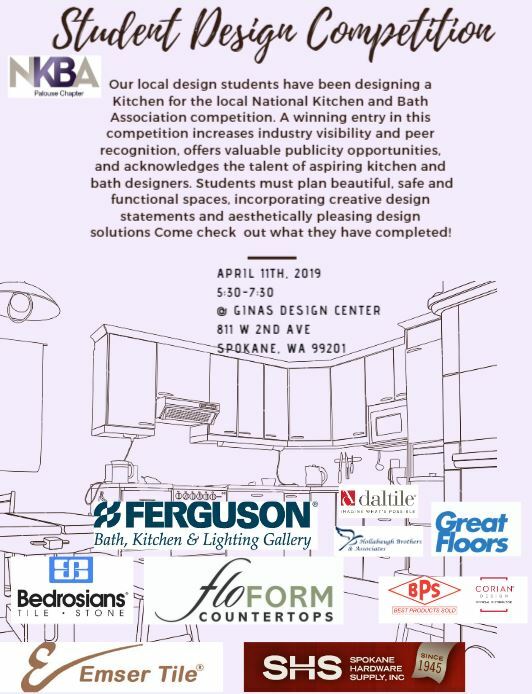 NKBA student members may enter the kitchen competition, the bath competition, or both. Entrants must design a kitchen and/or bath based on the client requests and plans provided. 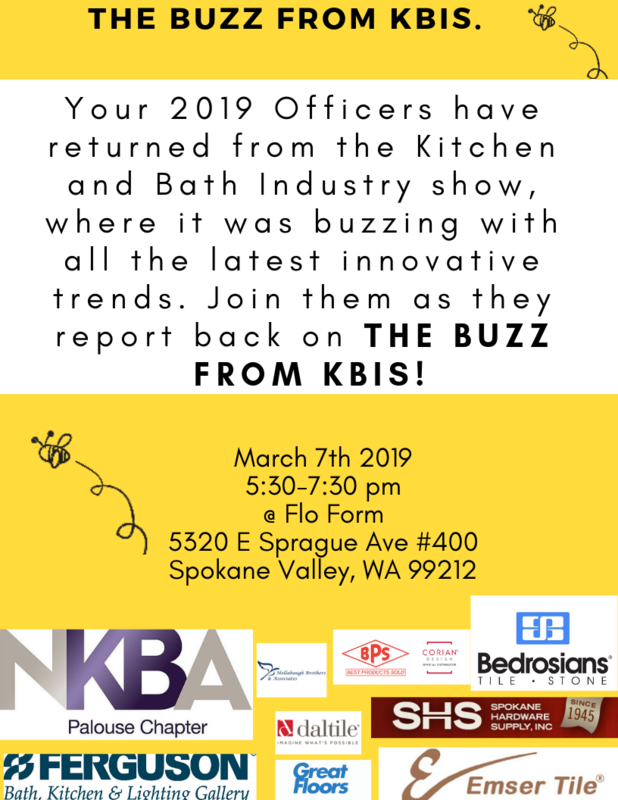 Your 2019 Officers have returned from the Kitchen and Bath Industry Show, where it was buzzing with all the latest innovative trends. Join them as they reports back on THE BUzZ FROM KBIS! Most kitchens are poorly lit. But designers and lighting experts don’t agree on which lamps work best in which fixtures, and especially where those fixtures need to be located. Since you can’t manage what you don’t measure, Doug first used a light meter app on his phone, to measure delivered foot candles on the countertops of the old kitchens he was working on. NKBA and IESNA agree that 50 fc is the minimum for kitchen counters. But most existing kitchens he measured had less than 20 fc. To do it better, he used client kitchens under remodel as his “lab”, and mocked up different types of fixtures, lamps and layouts. He quickly discovered that all lumens are not created equal. Choosing the right PAR30 lamp for instance, yielded 10 x more foot candles than a BR30 bulb, even though both bulbs were rated the same lumen output! Next, he redesigned their kitchen lighting and then had a lighting engineer model the layouts on a computer, adjusting the layout and beam spreads to achieve target light levels. Finally, he went back after the kitchen remodels were complete to take actual foot candle levels, confirming the simulations. Doug contends that the best kitchen lighting is layered, and comes from a blend of art, with a little bit of science to back it up. 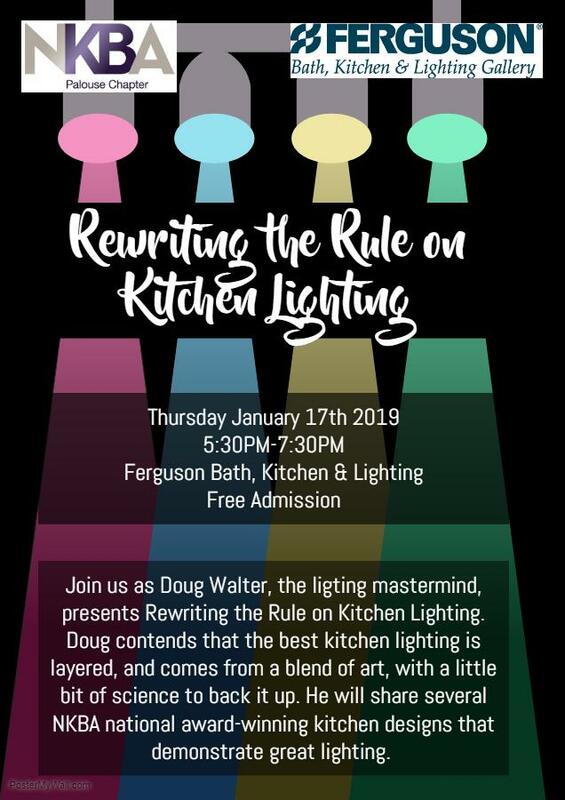 He will share several NKBA national award-winning kitchen designs that demonstrate great lighting. This was our March event that had to be rescheduled! This event will be held at Trutina, a newly built 55+ resort-style community. We wish to thank our event host Spokane Hardware Supply. Passion for a luxurious bath experience has gone mainstream, elevating the bathroom to one of the most intricately designed and unique rooms in any project. Moreover, because luxuriously detailed bathrooms are now the norm, rather than the exception, they are no longer reserved for just residential spaces. Today’s consumers are demanding top quality materials and products and from a cost-per-square-foot vantage point, the bath has evolved into one of the most lucrative rooms in any interior design project, from hotels to medical spaces. In fact, high-end design firms report the average cost of a bathroom has risen to between $300 and $600 per square foot! Recognizing that it literally pays to take notice of this no-end-in-sight trend, internationally acclaimed Interior Designer Christopher Grubb has embraced the potential of the bath in his own projects, and shares how to inject the bath those special and sophisticated details that resonate with consumers. As a seminar participant, you will be armed with the applicable and useful knowledge you’ll need to implement an unforgettable bath experience in virtually any setting. • What’s trending in materials and products, including stone, tile, countertops, and more. • How to spot products that will provide the luxury your clients demand with a budget in mind. • Which readily available products can help keep bath projects on schedule. • How to identify the luxury bathroom products that can easily transition between residential, commercial, medical and hospitality environments. • How to design aesthetics that comply with ADA and other codes. 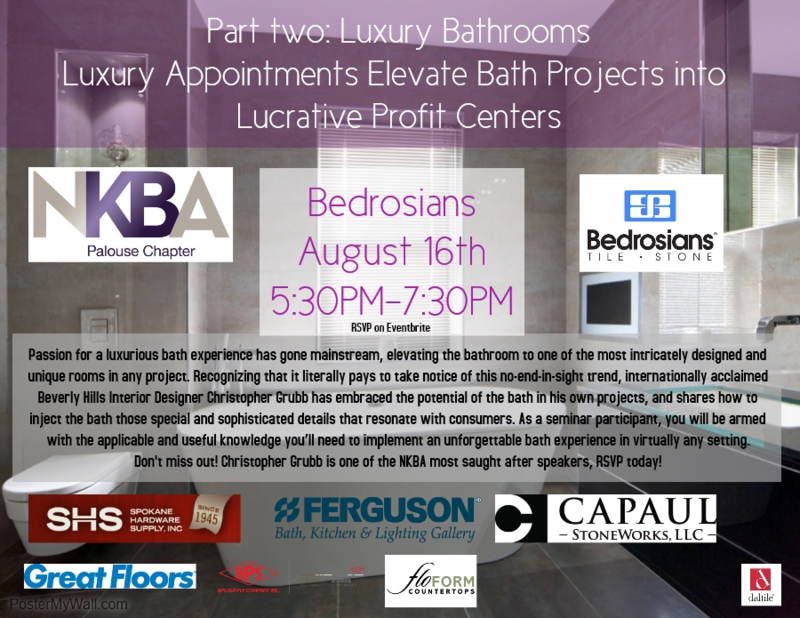 • How to successfully combine the vast array of unique and exotic materials available to create a bath that’s both luxurious and unexpected. • How to identify the earth-friendly materials that will provide LEED points, as well as aesthetic beauty. • Which accouterments enhance the sense of luxury in the bath, including audio/video, water features, plumbing fixtures, jetted tubs, color therapy, body sprays, headed floors, refrigeration, warming drawers, and more. 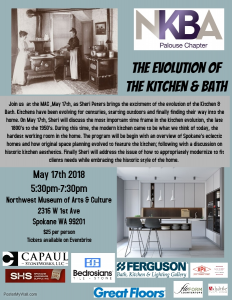 Maria Stapperfenne is an Award-Winning, Certified Master Kitchen and Bath Designer, as well as a Certified Living in Place Professional Instructor. In 2015 she was the NKBA National President, and in 2017 she was among KBDN “Top 50 Innovators” leading the K&B industry and elevating the trade. Join us as she presents on Designing for Independence. She will cover elements of aging, developmental and cognitive issues we should take into account, as we design for people of all ages and abilities wishing to remain in their home. Join us as your 2018 Officers Council reports back on the BUZZ from KBIS! 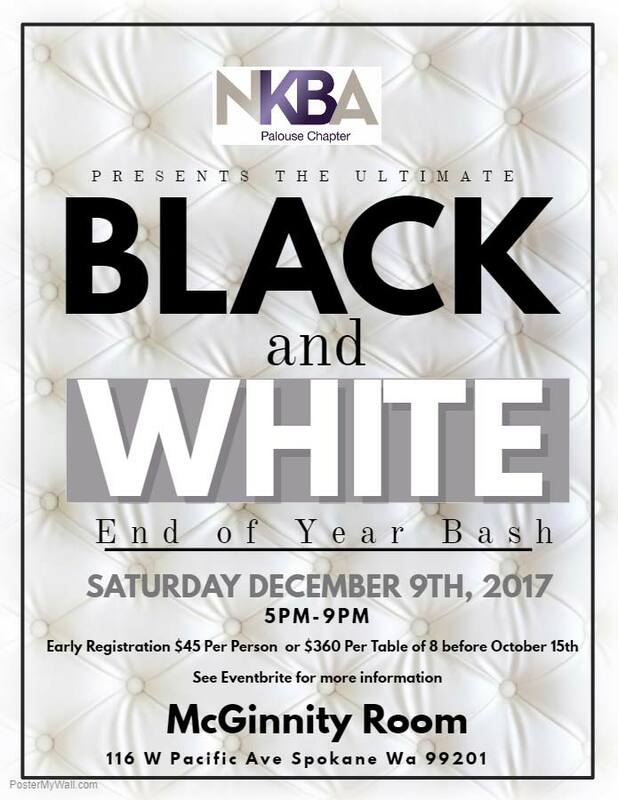 The Ultimate BLACK AND WHITE End of Year BASH! Wear your favorite team jersey and start the New Year off with the NKBA Palouse Chapter! You don’t want to miss our annual KBIS trend report or the fun and exciting things we have planned for 2017! Dress to impress for the NKBA Palouse Chapter’s finale of 2016 at the top of Spokane in the Historic Paulsen Penthouse. 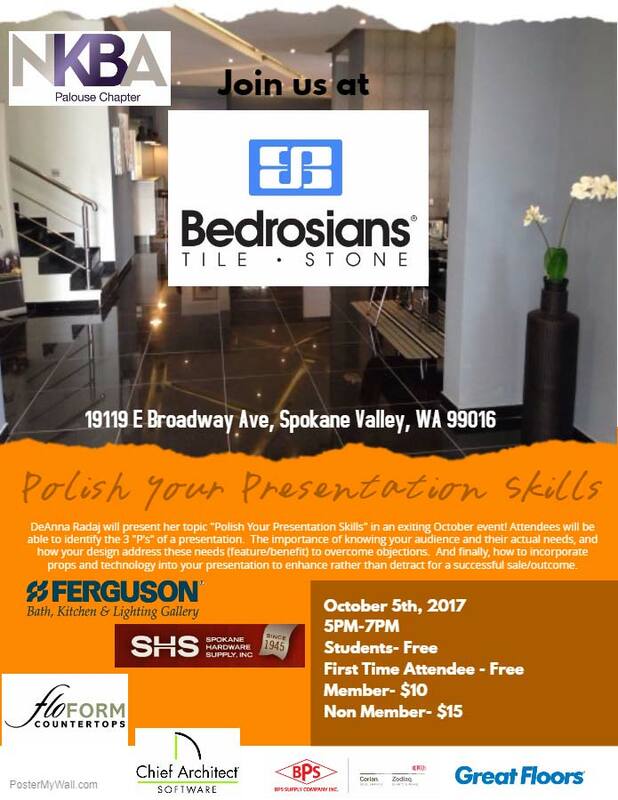 Festivities will include an Award Ceremony for our members, introduction of the 2017 Palouse Chapter Officers and raffle prizes to benefit the NKBA Student Scholarship fund. Cocktails, appetizers and mingling begin at 5pm, followed by a formal dinner and presentations at 6:30pm. Sustainable design is not just a trend in the built environment, but a lifestyle maximizing talents and personal fulfillment. 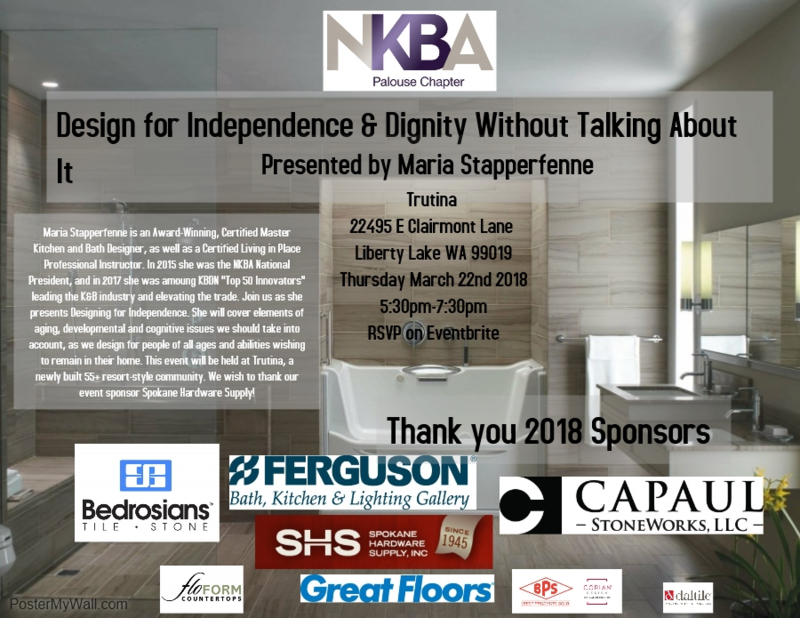 The NKBA Palouse Chapter welcomes Liesbet Trappenburg to discuss the direct correlation between sustainable design concepts, creativity and the work-life balance, and teach us the tools to create an action plan to define “success”. Gather your family & significant others for the NKBA’s annual Summer Social at Big Barn Brewery up on Greenbluff. Events include dinner by A Couple of Chefs Food Truck, Beer Tasting by Big Barn Brewery, Yard Games, Live Music, Photo Booth and Tree-Ripened Peach Picking. You won’t want to miss this quintessential summer evening! My favorite things in Technology! Today’s client has high expectations for a quick turn around from concept to completion. Do you have the technology and tools to save time and set the right expectation? 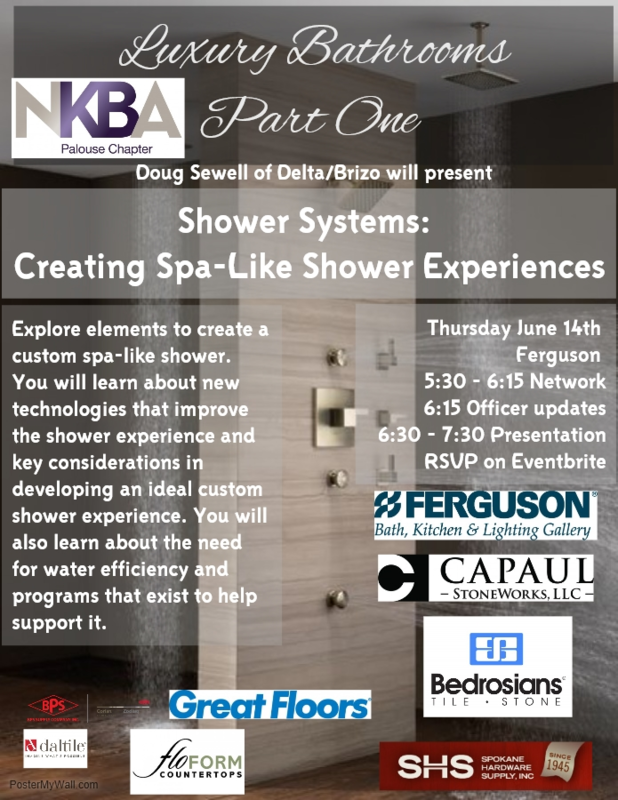 Join the NKBA Palouse Chapter for an evening of learning & networking with guest speaker Vanessa DeKoekkoek. Mix & Mingle at 5pm, presentation at 5:45pm. Virtual Reality is no longer science fiction. It is the selling tool for today! Watch the demonstration and hands on use of virtual reality design and presentation software your clients expect. 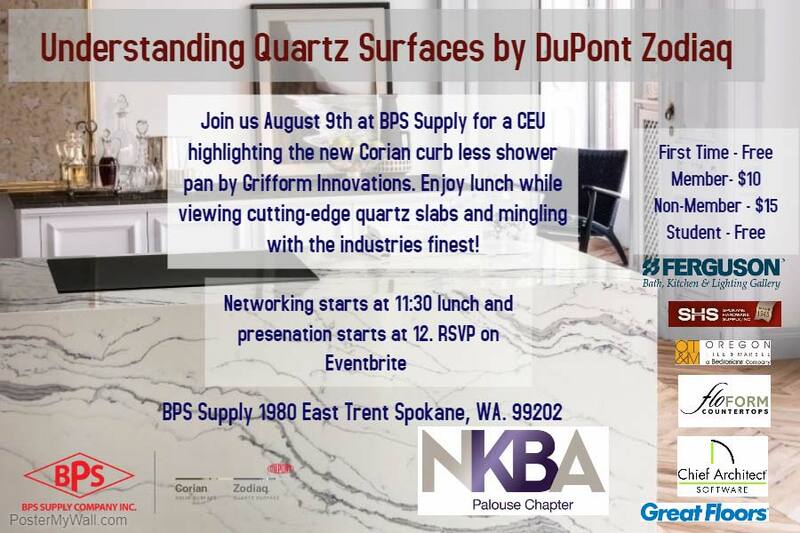 Join the NKBA Palouse Chapter for a lunch and learn presentation featuring guest speaker Vanessa DeKoekkoek. Presentation with light lunch begins at noon. Watch live cooking demos and eat delicious food while getting your questions answered about steam cooking in the American kitchen with guest speaker Janne Mahan. Spokane’s First Friday Art Walk in April will include SFCC Interior Design Student kitchen and bath projects. Come down to Kimberlee Kristine’s 164 S. Browne St. and cast your vote for the People’s Choice award! Support the future of our industry! Albert Rooks of Small Planet Supply Inc. will discuss the Deep Energy Retrofit of a 1977 wood framed residence in Olympia, WA. Strategies of airtightness, thermal bridge construction, triple glazing, heat recovery ventilation and COMBI space conditioning will be discussed in this case study. Join the Nkba for a Pre-Game Funk as we kickoff the New Year with a trend report from KBIS. We have some exciting plans for 2016 to share with you!!! Wear your favorite team jersey and enjoy some tailgate style.